The TouchSurface was the first touchpad device intended for human-computer interaction that used a mouse-control paradigm: relative dragging motions, tap to click, etc. And it was pressure-sensitive. The TouchSurface was developed between 1988 and 1993 at Intelligent Music in Albany NY, a company founded by Joel Chadabe. The technology was ultimately licensed to Stratos Product Development but never reached the marketplace. Shown above is a prototype that demonstrated the TouchSurface as a peripheral computer pointing device. 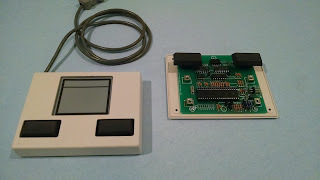 The traditional left-right mouse buttons were included, however the prototype could also generate mouse clicks based on tap gestures. The device drew its power from the data lines of an RS-232 serial interface, so no power source was required. 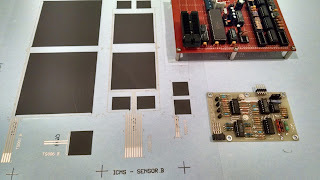 There were no USB or even PS/2 peripheral device interfaces when the TouchSurface was designed. Originally intended as a highly nuanced controller for musical instruments, when Windows 3.0 was released in 1990 the combination of a graphical user interface running on a laptop clearly demonstrated the need for a flat and inexpensive integrated controller to replace the mouse and trackball devices that were popular accessories at the time. So Intelligent Music shifted its focus and aimed for the computer industry, specifically engaging with computer keyboard manufacturers. 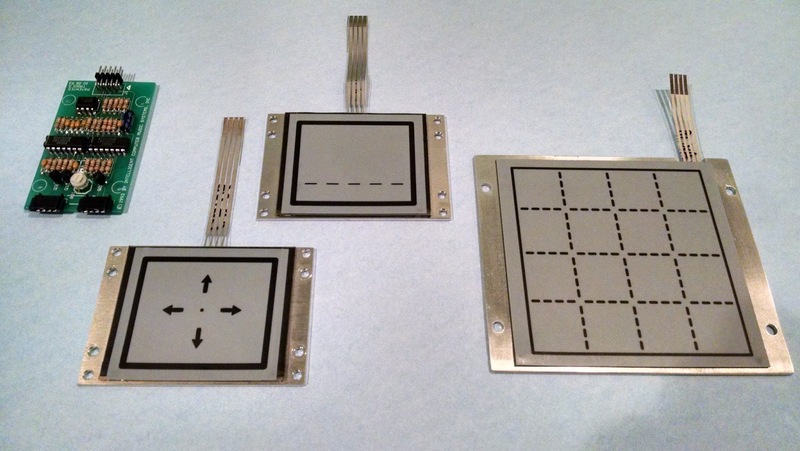 The TouchSurface could be printed on the same mylar substrate as a keyboard switch array and used the same 8051 microcontroller, resulting in an extremely small incremental cost to a standard computer keyboard. The TouchSurface pointing device worked as a direct replacement for a Microsoft Mouse, but custom device drivers for MS-DOS and Windows allowed for applications to use pressure-sensitivity, improved signal processing of gestures, and advanced features like a hot-zone for quick menu pull-downs. Typical uses of pressure sensitivity included changing shape sizes in drawing programs, and modulating sound for music programs. 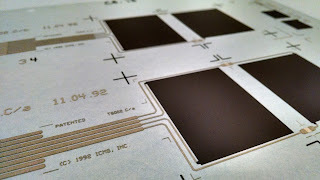 The touch sensors were printed with thick-film electrical inks using a silk-screen manufacturing process. Only three ink layers were required: a silver ink for conductive traces, a resistive ink for the position and force sensor, and a dielectric ink to insulate the conductive areas. The resistive ink was doped with molybdenum disulfide, an industrial lubricant similar to graphite but non-conductive, which created a microscopically rough surface enabling up to three decades of force sensing using the simple principle of increasing the area of contact in proportion to the force applied. 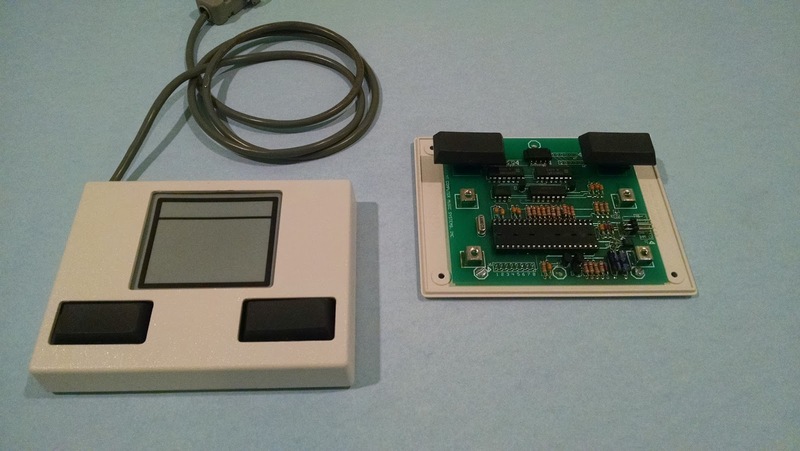 A few experimental souls purchased developer kits, shown above, which included a mounted touch sensor with an analog interface board that produced X, Y, and Z control voltages with a trigger signal. As with any technology, the TouchSurface evolved over time with a variety of sensor sizes and formats, and different controller circuits. During several years with Intelligent Music, David Asher developed the sensor designs and manufacturing process, analog control circuits, embedded microcontrollers, device drivers, application software, and wrote four patents. 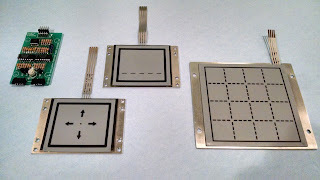 The principles of TouchSurface operation are described in patent 5,159,159: Touch Sensor and Controller. Why Is Airport Food So Bad? (C) 2011 by David Asher, All Rights Reserved.. Simple theme. Powered by Blogger.